Our Verdict: Keystone Vapor brings fun and interesting flavors in their line of e-liquids, including tobacco blends, without the roughness that you get from real cigs and other e-juices. 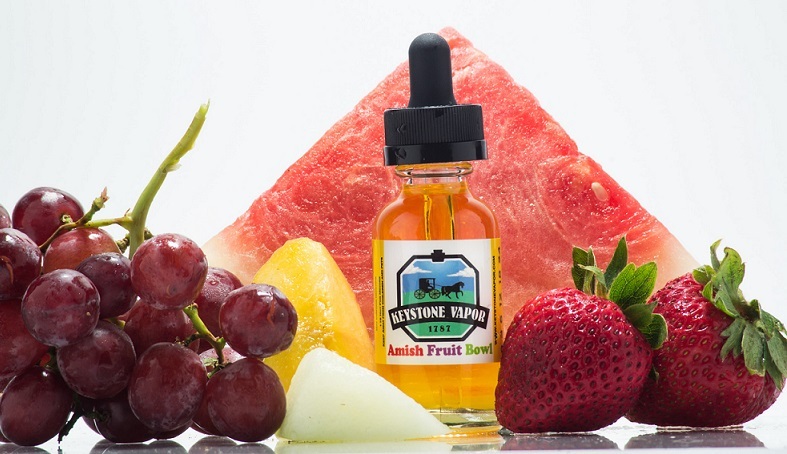 Vapers who want their e-juice to be mild yet tasty should get Keystone Vapor’s great mix of flavors, inspired by local Pennsylvanian tradition. A popular favorite among fruit lovers, the Nates Nectar is a juicy e-liquid that has a sweet peach base topped with some pears. This flavor tastes like something picked from a backyard full of fresh, crisp fruits that deliver just the right sweetness. Without any overpowering aspect in this e-liquid, vapers will enjoy how a subtle yet pleasant hint of strawberry and honeydew melon finishes off the mix. Nates Nectar is a great all day vape that gives you a tasty fruit medley on your mouth as you vape billowing clouds of vapor. If you want your fruit mix to be creamy and light, then the War Pig is your kind of vape. It is a ‘melody of fruits and coconut with a slight creamy flavor’, as stated in Keystone Vapor’s website. This is an accurate description from the maker itself, since the flavor tastes of a variety of fruits that harmoniously blend. The exhale is smooth and creamy, perfect for vaping all day without the strong and off putting taste of chemical flavors that are sold by low-quality brands. Another top selling e-liquid from Keystone Vapor, the Neshaminy Creek is a blend of crisp and fresh pears with juicy coconut, topped with a cool and refreshing icy flavor. The fruit and coconut mix is invigorating in itself, as there only subsists the most natural taste of both aspects. This is finished off with an icy exhale that leaves you with nothing but a clean and crisp vaping experience, reminiscent of the good old days spent by the creek. While Keystone Vapor has yet perfected this e-liquid in terms of achieving the ideal mixture, the taste has already gained noteworthy responses from vapers. As what the name says, the Pineapple White Tea is a mixture of revitalizing white tea and sweet pineapples that are mild and zesty at the same time. The pineapple flavor gives the whole blend a bit of fruity sour and sweetness that does not overpower, yet is distinguishable all throughout. Tea time does not necessarily have to be monotonous—it can be with this thrilling tea flavored vape juice that is both relaxing and enjoyable. Keystone Vapor requires vapers to shake the mixture before using since the flavoring tends to separate from the mixture. As they are currently working on addressing this issue, the manufacturer is eager in preserving its taste. For all root beer lovers who want it different with a taste of birch, the Birch Beer from Keystone Vapor is a must try. This e-liquid blend has an inhale that is sharper but lighter in flavor compared to plain root beer vapes. It ends with an interesting crack that mildly stings your taste buds as you exhale. The overall flavor is rich and tasty, yet not too potent for a delicious all-day vape. It is as if you took a tall glass out and filled it up with refreshing birch beer, straight out of the tempting image that Keystone Vapor uses for this particular flavor. An e-liquid that makes your mouth water with just the thought of its flavor, Peanut Butter Cup is an indispensable go-to juice for those who love the famous creamy chocolate and peanut butter combo. The perfect blend of rich and creamy peanut butter with a bittersweet chocolate note is a perfect hit on the target. Brand: Keystone Vapor is known as a Pennsylvania-based e-liquid brand that was founded by a DIY lover who wanted an additional source of income after having served in the US Marine Corps for four years. Bringing with him the challenging experiences of serving the country through patriotic nationalism, the founder of Keystone Vapor learned how to personalize and enhance the company’s customer service towards anyone who comes into their store. In fact, the very person who established Keystone Vapor is famous for doing notable favors for customers. On multiple accounts, he is praised for driving them to his “home laboratory” to mix a fresh bottle of War Pig when it is out of stock at their store. He also goes out of his way to entertain and address the needs of military veterans who need assistance. Some people are not into such a personalized version of the concept of customer satisfaction, but many people are just amazed at this act of kindness. Since 2009, the family-owned company has been creating fun and exciting vape juices that are mostly based on rich Pennsylvanian-Dutch culture. Keystone Vapor has done excellently in recreating their famous recipes into all-American flavorful e-liquids that are now gaining more popularity among vapers from all over the US, except Arkansas. Bottles and Flavors: Keystone Vapor bottles their e-liquids in such a way that customers’ preferences are given priority. They offer 10ml e-liquids in small nozzle plastic bottles. Their 30ml e-juices are offered in glass or plastic bottles with eye droppers that make it easy for vapers to refill their tanks and cartomizers. Keystone Vapor also has 130ml bottles that come with narrow nozzles. They have colorful labels with great aesthetics, a logo that depicts a horse and carriage on a green pasture, suggestive of the rich culture and tradition where Keystone Vapor gets its ideas. Each label has warnings and states the ingredients, nicotine level, and flavor of the e-liquid. When shipping their bottles, Keystone Vapor makes sure everything arrives at the right address in great shape. Keystone Vapor e-juices are available in Max VG, 50-50 or 30-70 PG-VG blends, except for the Pineapple White Tea, which is currently not available in Max VG. Some of their flavors come in 6 nicotine levels (0mg, 3mg, 6mg, 12mg, 18mg, and 24mg), while others are offered without the 24mg option. Nevertheless, the available nicotine strengths suffice the needs of ex-smokers who want to turn their backs on the stick. Representing four different flavor groups, all e-liquids from Keystone Vapor can be categorized as tobacco, drink, fruit, and relaxing savory flavors. Most of their flavors are a mix of more than one particular taste, blended pleasantly to create unique and exciting e-juices. There is no denying in the power of their Max VG blends, as vapor production is just wonderful. Cloud chasers will love how these e-liquids produce billowing vapors with a smooth and mild throat hit. Keystone Vapor is not only popular for their in-store customer service but is also admired for excellent rapport with their online buyers. For every order made, the staff makes sure that a personalized, hand-written note is sent to the customer to thank them. This tradition has been extremely effective in making vapers feel important and prioritized by the company. Shipping is via USPS, with a maximum 72-hour turnaround time to ship out orders that were done online. They do, however, give you an option to pick-up your orders instantaneously at their manufacturing address in Pennsylvania. Keystone Vapor is a member of the Smoke-Free Alternatives Trade Association. At the moment, they neither give refunds nor have a money-back guarantee for their customers. To conclude, Keystone Vapor e-liquids are exceptional e-juices that aim to satisfy the taste of vapers who want excitement and fun in their everyday vaping experience. They offer a wide enough selection of flavors, nicotine levels, and VG-PG ratios to address particular vaping needs while making sure each flavor is a mix of wonderful tastes to satisfy your buds. Their customer service, whether in-house or online, is superb, with a unique touch of personality that the owner brings forth as the company grows. Know more about Feghali Vapor from our review. Learn why it is one promising e-liquid brand that offers premium flavor blends at affordable prices. Apollo E-liquid offers a wide range of flavors in 5 nicotine levels. Find out how they rank via our review based on flavor, selection, and vapor quality.